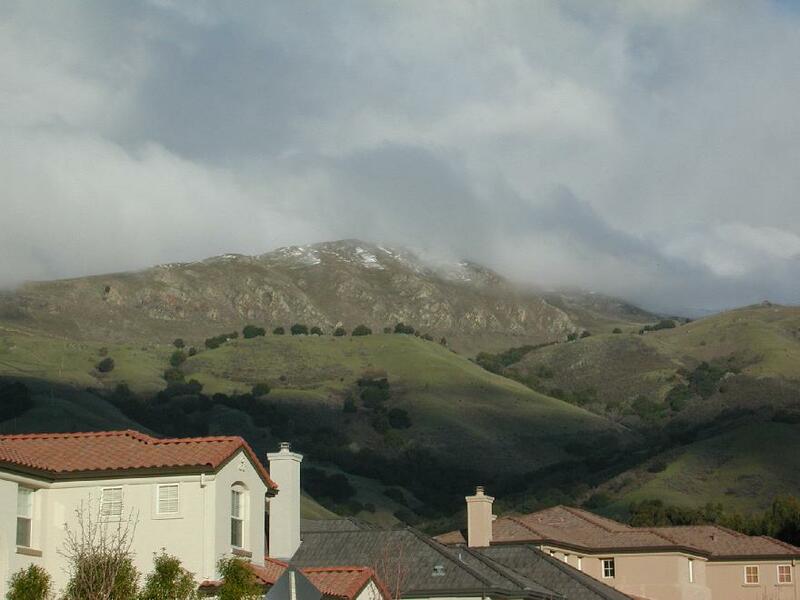 Mission Peak with snow from Stanford Avenue, February 12, 2001. Here is a map of the trails on Mission Peak, a popular hiking spot in Fremont, CA. The map was made from the GPS tracklogs of separate hikes up to the summit from the Sunol, Stanford Avenue, Ohlone and Ed Levin trailheads. Much more technical information is available on our GPS page. Here are some topographic profiles of the trails up Mission Peak. These profiles were generated from tracklogs and waypoints made using a Garmin GPS receiver with differential correction. The elevations were recorded by hand, since the Garmin 12XL does not include elevations as part of waypoint data. The lateral coordinates are good to ±2m, while the elevation data are somewhat less accurate. The distances displayed are the integrated distance along the trail as obtained from the tracklog, which is taken at much higher spatial resolution than the waypoint data. The interview with Roan McClure, former Mission Peak rancher was conducted on November 24, 2006. All audio files are in the Ogg Vorbis format. This map shows the location on Mission Peak of the sites mentioned by McClure. The story of the Moore/McClure family, early settlers on Mission Peak, as written by Roan McClure. Also read an article about the McClure Ranch by Dennis Rockstroh of the San Jose Mercury News. .
A highly recommended book is the well-illustrated Washington Township: A Pictorial History. See photos of the McClure/Moore swimming pools atop Mission Peak, early buildings in Mission San Jose, and the McClure's Mission Peak monument. The book is available through Washington Hospital (scroll to bottom). Courtesy of Dennis Rockstroh, read the lowdown on the Mission Peak wild goats. (36K with image) As of summer 2002, there are two goats left. Much more information is available in Two Centuries at Mission San Jose by Philip Holmes. Get this book at your local Fremont Bank branch. A summary of Holmes' research is available on-line. The Tri-City Voice often has articles by Philip Holmes about local history, for example about the early history of Osgood/Driscoll Road. Wings of Rogallo notes, "From Mission Peak, Dave Kilborne became the first pilot to foot-launch and soar a hang-glider in 1972." So on top of everything else, Mission Peak is the birthplace of hang-gliding. Math/Science Nucleus has a description of the area that focuses on Mission Creek. Mission Peak is the headwater of most of Fremont's streams. Find out how water flows from Mission Peak into Fremont's Lake Elizabeth. Identify Mission Peak wildflowers using an excellent identification key put up by experts at Henry Coe State Park. Identify virtually any local plant using the excellent resources of CalFlora, a web page that is as all-inclusive as it is easy to use. Identify common lichens and learn about their biology at a website with remarkably lovely photos. The stuff hanging from trees that we all call "Spanish moss" is really lace lichen (Ramalina menziesii) and was used by the Ohlone for baby diapers. Lace lichen is the fastest-growing species in North America according to a recent excellent article by the same authors in Bay Nature magazine. Math-Science Nucleus has excellent fields guides to local birds, amphibians, trees, grasses, shrubs and flowers, aquatic plants, fossils and geology. The fossils include not just the usual molluscs but mastodons and saber-toothed tigers. Well done and highly recommended! List of Mission Peak birds. Mission Creek has its headwaters on Mission Peak. Can you imagine the East Bay hills without oak trees? Me neither. Consider joining the California Oak Foundation. View a detailed report (including several geological maps) concerning the famous Mission Peak landslide. Highlights: "Mission Peak and Mission Ridge are comprised of a resistant plug of overturned Briones sandstone which appears to have been thrust upward between eastern and western traces of the Mission fault . . . The site lies within a tectonically active zone. Mission Ridge appears to be rapidly lifting along the Mission fault. This rapid uplift of the Briones sandstone creates over-steepened slopes with an abundant supply of fractured blocky rock, available to cascade over 1,000 feet downslope. . . ." Fascinatingly the Mission fault passes right near the summit, creates visible offsets along Aliso Creek, and transmits slip between the Calaveras and Hayward Faults. Four of Fremont's landmark trees are at 2015 Stanford Ave., right near the parking lot of the staging area. Jane Huber's encyclopedic Bay Area Hiker page includes a description of the Stanford Avenue hike with several nice photos. Of course Wikipedia has a Mission Peak page. The Berkeley Troop 24 Boy Scouts list Mission Peak in their "Rim of the Bay" guide. Note however that "these hikes are not approved for Cub Scout use." The East Bay Regional Park District's Mission Peak page features a new map. The Bay Area Ridge Trail Council has some guided hikes on Mission and Monument Peaks. They also have maps and a trail description describing the Ohlone College to Ed Levin hike. The Mission Peak Striders, a local running club, occasionally tackle Mission Peak. Their website has several nice photos. The local Sierra Club chapter has a hiking page that includes some Mission Peak and Ohlone Wilderness trail trips and scads of photos. I hope the folks causing erosion by taking shortcuts off the trails are not part of the Sierra Club group! Santa Clara County Parks District has extensive info about hiking, biking, and horseback riding in Ed Levin Park. There's even a downloadable map. Mission Peak and Monument Peak (in Ed Levin) are famous spots for hang-gliding and parasailing. Read about how to get started in hang-gliding at the Mission Soaring Center. The Wings of Rogallo has a Mission Ridge soaring page. Follow the action from your armchair using the Mission Ridge webcam. The slightly less adventurous can join the South Bay Soaring Society in launching radio-controlled planes from Mission Peak. If you click the links on the left sidebar, Summitpost.org has a bunch of photos and commentary about Mission Peak hikes. Sunol Wilderness Pack Station. Trail rides ranging from one hour to overnights leaving from Sunol Regional Wilderness. For information about mountain biking on Mission Peak, mtbr.com is a good bet. On the other hand, the sleazy Java Velo page features some of our WSRCC photos without giving us credit. 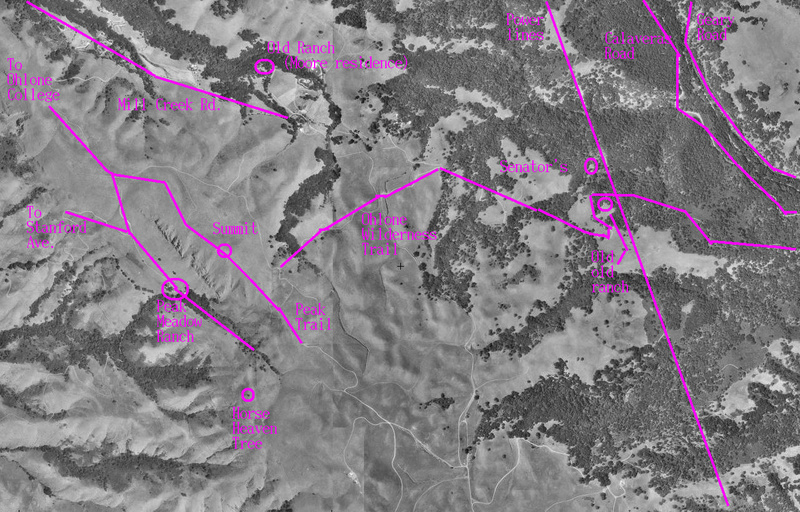 View a satellite image of the Mission Peak summit using the Microsoft's terraserver site. The summit is at center-right while the Peak and Horse Heaven Trails are clearly seen on the left. The Eagle Trail is at right. The McClure Ranch home is at the bottom center. Mysteriously the image is labeled "San Jose, California." (What did you expect from Microsoft?) Thanks to Jerry Andrews for the suggestion to include this link. What's the Mission Peak weather right now? Find out using your choice of webcams: from Newark (I would guess) or from the Warm Springs section of Fremont or Mission Ridge webcamfrom the mountain itself. Yahoo has a Mission Peak webpage that seems to indicate that Mission Peak is in San Francisco. Fascinatingly we learn that Mission Peak's street address is 43600 Mission Blvd. I never would have thought to ask. Wolfgang did most of the work, including lugging the differential DGPS receiver with its lead-acid battery all the way up to the summit several times. Thanks also to Lou Terminello, Bob Teeter, Michelle Geary, Kevin Lahey and Dave Brock for accompanying us on these hikes. $Date: 2007/01/14 01:44:20 $ ..